Getting to Quetzaltenango is reasonably straightforward, even though there is no air link with Guatemala City's La Aurora International Airport. Comfortable bus transport is on hand, with buses travelling the five-hour journey from La Aurora Airport to Quetzaltenango on a regular daily timetable, arriving at their own bus terminals within the city. For travel outside of the city, the second-class 'chicken buses' are an unforgettable, if crowded, experience, while smaller microbuses transport passengers around the city to popular destinations. Taxis are easily hired and in good supply at many places of interest. 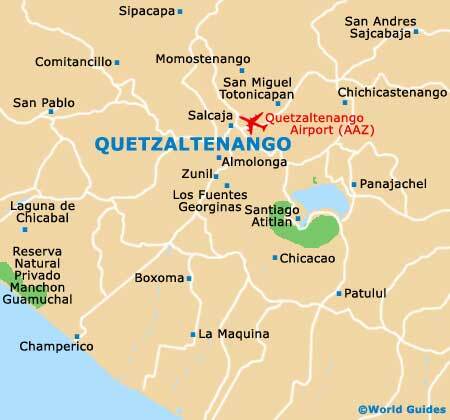 Quetzaltenango Airport is set in the north-eastern zone of the city. In 2006, this airport was just a grass landing strip with one small hangar. After some major construction work, including the addition of a tall control tower, the airport now features a small selection of private charter flights, connecting Guatemala City, where the considerably larger and extremely busy La Aurora International Airport resides. Car and motorcycle rental in Quetzaltenango is easily arranged in advance online with a choice of rental companies, or in the city upon your arrival. It is best to choose an international company to make sure that you hire a car which has been well maintained, especially if you intend to travel around the region extensively. Do note that during the rainy season, some roads can become flooded or impassable. Book your Guatemala City Car Rental here. First-class buses run from Guatemala City to Quetzaltenango, a five-hour journey, with a number of bus companies providing this service. All have their own terminals within the city. Taxis are plentiful, particularly around the Old City and any nightlife venues. It is best to grab a cab on a public square (such as the northern side of the Parque Centro America) rather than in a back street, and it is a good idea to write down its number, as well as agreeing the fare in advance. Walking around at night is not safe and therefore taxis should always be used, however short the journey.